Shopkins are all the craze lately. Shopkins beat out Disney, Lego, and Barbie for toy of the year among girls this year in the USA. That is pretty incredible and speaks to just how popular Shopkins are these days. Something else that demonstrates the popularity of Shopkins is that they are really hard to find in store. If you are wanting to purchase Shopkins, at least around where we live, you pretty much have to call or go to the stores that carry them every couple of days to see if their shipment arrived. We have gone to stores that received their shipment earlier in the same day and their stock had almost already been depleted within the same day! So what are Shopkins? They are mini figurines of household foods and products. To date, there has been Season 1 and Season 2 of Shopkins released. I have been keeping an eye on the news and Season 3 of Shopkins is set to be released sometime in the near future. Sorry I do not know the exact date. There are a number of thinks that you need to know about Shopkins if you have a little Shopkins fan like I do. *I already told you about the seasons. *Shopkins come in different levels of classification from common, rare, ultra rare, and special edition. The ultra rare and special edition Shopkins can already get a pretty good price as they seem to be highly sought after. *There are different “finishes” for Shopkins from glitter, frozen, metallic, to baby. There could be more but these are the ones I know of. *There are different colors of the same “character” and yes, the collectors seek out to obtain all the colors. *Shopkins come in different packages for purchase from 2 pack, 5 packs, and 12 packs. In the packages you cannot see at least one of the Shopkins as it is wrapped in a yellow plastic bag so it is a surprise one. 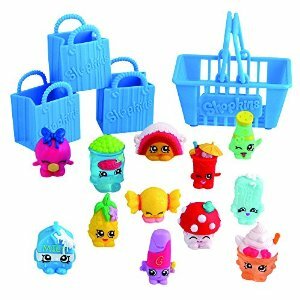 *Season 1 Shopkins come with the blue shopping bags and baskets. *Season 2 Shopkins come with the purple shopping bags and baskets. So if you can remember the above facts about Shopkins, you have a good foundation. 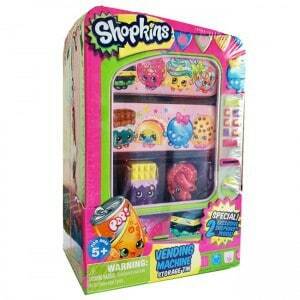 One product that I have found that I love is the Shopkins Vending Machine. 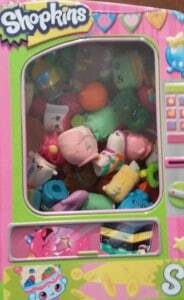 The Shopkins Vending Machine looks like a vending machine and comes with two Shopkins that you can see. Why I love the Shopkins Vending Machine is that it acts as a wonderful container to keep the Shopkins’ collection all together. My Little One who just turned 8 is absolutely crazy over her Shopkins. It seems that she just can never get enough of fun time with them. For her 8th birthday that just passed, all she kept asking for was Shopkins. It seems that when I hear the girls talking, that a lot of them are talking about Shopkins. My Little One also brings a few Shopkins to school quite often for her and her friends to play with at recess. I am not sure why all the girls are a craze over Shopkins, but I know why I support and love them……I love Shopkins because they tap into imaginative playtime. My Little One can sit and play with her Shopkins for quite some time. When friends come over for play dates, Shopkins are surely on the list of must play toys. If you are looking to purchase Shopkins, they can be found in your local toys store when in stock. Otherwise you can check online at Amazon Canada and Amazon USA. I am really excited to announce a giveaway for a Shopkins So Cool Fridge. This giveaway is open to residents of Canada and the USA over the age of 18 and where permitted by local laws to enter and win giveaways. Please ensure that you read the full terms and conditions found at the bottom of the entry form.